Audience measurement giant comScore notified investors that its shares are at risk of being delisted from the Nasdaq stock exchange, given the publicly traded company’s failure to report required financial data to the Securities and Exchange Commission. At least one equities firm, Oppenheimer, pulled its “buy” rating from comScore’s shares following the news. 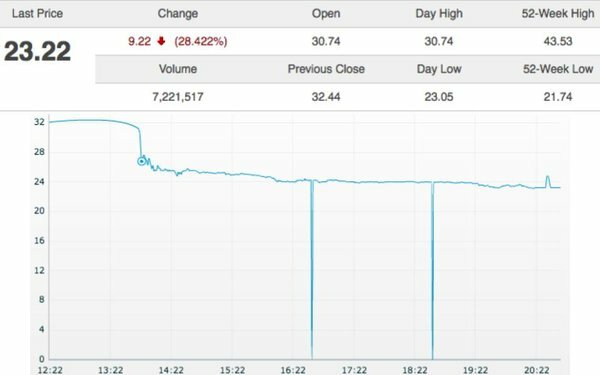 The company’s stock price fell 28% to close the day at $23.22 per share. "Although we are disappointed that we will not meet Nasdaq's deadline, we have made significant progress toward the restatement and in strengthening our internal audit and compliance function,” comScore cofounder and CEO Gian Fulgoni stated. He added that comScore continues to have a “healthy balance sheet with $116 million in cash,” and that its strategy and road map continue to be on target. comScore, which is Nielsen’s chief rival in audience measurement -- especially for digital media -- has been in turmoil for months, following a shakeup last summer in which Fulgoni replaced Serge Matta as CEO. That followed the resignation of cofounder Magid Abraham as vice chairman. WPP owns a significant minority stake in comScore, which it picked up as part of comScore’s acquisition of Rentrak last year.